What’s so “wow” about Cailyn Cosmetics’ O! Wow Brush? First, the patent-pending design. It looks like a sculpture, but each artistic feature is actually a carefully designed benefit. The bristles are ultra-fine and so densely packed they feel like velvet. Touch the lush surface and you’re likely to exclaim (as we here at The Grommet did), “Oh, wow!” This incredible surface offers the best of a brush and sponge, giving you complete, streak-free coverage with an airbrushed effect. The pyramid base lets the brush stand all on its own, with an alluring tilt to the handle that’s designed to fit snugly in your hand. That means greater stability and precision. And the pointed tip and domed angular shape make blending creams and powders seamless and contouring effortless. Cailyn's other innovative makeup brushes include the 4-in-1 Eye Brush and 4-in-1 Lip Brush. Both are single applicators with two removable dual-end brushes. The ends have different shapes that let you create dozens of different eye and lip looks with a single tool. All in all, Cailyn makes it super easy to create a whole lot of wow. Hello everyone! I am thrilled to bring our O! Wow brush to The Grommet today. I'm happy to answer any questions you have like I did with Mike below. What inspired you to create the O! Wow brush? The development of O! Wow brush began with one idea- How can we achieve streak-free perfect coverage? There are many brushes for face makeup, but they leave fine streaks and lines. O! Wow brush is designed with an angular dome shaped head with densely packed ultra fine fibers to reach every corner of the face- the hollow of the eyes and the side of the nose, with an immaculate streak-free touch. Beauty does not happen accidentally; it is engineered. Why is this something every person applying makeup should have? O! Wow brush have versatile function for everyday face makeup application. First, The velvet-like densely packed bristles create smooth airbrushed finish. Second, Angular, dome shaped brush head can conveniently blend the foundation , powder, cream, moisturizer, and primer seamless onto skin. Third, Pointed tip perfectly fit underneath the hollow of the eyes and side of the nose for perfect coverage and for contour shading. Fourth, the sturdy, tilted handle fit perfectly in the palm for precision and satiability. Fifth and finally, slip off cap prevents bristles from germs, dirt, dust and bacteria and makes the ideal travel companion. The effect of the brush is unprecedented. It gives you an airbrushed look when applying your makeup leaving your face streak free. Are you worried about the folks at Photoshop getting mad you’re naturally stealing their business? We acknowledge and understand the natural beauty within everyone. The purpose of O! Wow brush is to assist in building the basic foundation for these natural beauty to shine out. With stronger foundation, the adjustment on Photoshop will be easier, and more dramatic. Don't worry Photoshop, we are here to help! @Viridiana why would i buy this on the grommet when amazon has it for 20% less and free shipping? Have you used the brush Mike? Our hope is because you support what we are doing at The Grommet, Suzy! Hi Deborah, I have not, but there are enough folks here at The Grommet who have and they love it! @Suzy Hi Suzy! Cailyn Cosmetic store on amazon is not operated by our headquarter. We are in process of contacting amazon to close all unofficial sites that use our company name. CAILYN will not be guarantee the products sold by unofficial sites. @Viridiana Well that is not right. It is STILL YOUR PRODUCT! You should be liable for it no matter who sells it and you must have at one time given Amazon permission to sell your product or else they would not be doing so. Everything there is far cheaper than it is here...and you do NOT have to be an actual prime member; you can be a GUEST of a prime member to get the same benefits. This site overcharges for everything and the shipping is ridiculous. Hi Sandra, thanks for the comment. It isn't right, and we hope that Viri and co. get it sorted out soon. As far as things being cheaper, products might be more expensive because we're working with small-scale Makers as they are just starting out. Sometimes that means selling at a price that is out of the budget for some which shouldn't be confused with overcharging. We don't want you to break the bank. We are never out to get you with price, but we are bringing these products to your attention so you may choose to support these Makers as they work to create an affordable product for all. @Mike @Sandra I love The Grommet and have found the prices to be very reasonable. In fact, many of the things I've ordered are priced exactly the same as on the products' website. Also, I've never had an issue with the shipping charges - they seem to be very fair. In addition, on The Grommet, you can ask the MANUFACTURER questions about their product - something you can't typically, if ever, do on Amazon. In fact, on Amazon, you can't even be assured that the product being offered is authentic and not a cheap imitation. I so appreciate The Grommet bringing innovative and unique products to my attention! Without The Grommet, I would have never known about the wonderful,useful products I've purchased. @Rhonda, my thoughts exactly. Sandra, wow, take a breath. You don't have to buy anything on this site. The rest of us that do find this site to have good value, variety and supporting individuals or small companies rather than Wal-Mart or Amazon. Please feel free to shop elsewhere. Personally, I think this brush is worth the money. Thanks for the kind words, Mliss and Rhonda! @Mike I am in total agreement with Rhonda. This is a fabulous site, I would never know to go looking for so many innovative, captivating, appealing products if I didn't already know they exist -- thanks to Grommet. For myself and for my giftees, this site has provided delight for years. Thank you, brilliant idea! I can't hear the video, so....what material is the brush made of? Can you explain the lip brush better? It says "single applicators with two removable dual-end brushes" Not sure I understand what that means. @Veronica Hi Veronica! Thank you for your interest in our brush! Both O! Wow Brush and 4-in-1 Lip Brush is made with ultra-fine synthetic nylon fibers. Body of O! Wow Brush is made with lightweight plastic, and 4-in-1 brush have sleek aluminum body. 4-in-1 Lip Brush have two removable dual ended brush on each side of the aluminum body. You can easily pull out the brush from one side, flip, and pull it back. You'll be able to find more clear image of this brush on our website. What about cleaning the brush? @Donna Jean Hi Donna! That's really good question! You can soak the brush head in any brush cleaner for a minute or two, then wash the dirt, grime, and leftover cosmetics under warm running water, as you would of any other makeup brushes. It's advised to wash your brush regularly to avoid contamination and to improve brush performance. How do you clean the brush and can you replace the bristles? @Pam Hi Pam! Brush head cannot be replaces for O! Wow Brush, but for 4-in-1 Eye Brush and 4-in-1 Lip Brush, brush head can be switched around to match your need. For all of our makeup brushes, you can clean them using brush cleaner or brush shampoo as you would of any other makeup brushes. Do you need an O! Wow brush for each product? 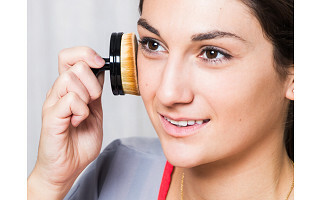 Or, can I apply my moisturizer with it and then move straight onto foundation, powder and blush all with the one brush? @Diane You can use O! 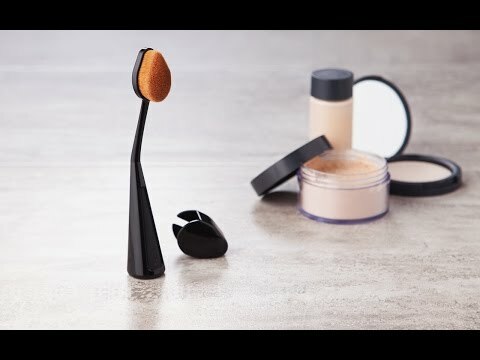 Wow Brush for all products listed above, but it's advised not mix the moisturizer, base makeup, and blush for clearness of makeup application. Unless you clean the brush after each product application, the leftover makeup from previous step can taint the next step. Didn't MAC cosmetics have something very similar that broke almost immediately because of that thin neck? Will this one snap break too? @Suze Hi Suze! Our brush neck might look thin, but it won't be broken easily. The plastic we used is P.B.T (Polybutylene terephthalate), thermoplastic engineering polymer. It's more elastic and bendy than regular plastic, so the brush head will tilt easily for your convenient use. Does this brush shed or leave lint like other makeup brushes I have dealt with in the past? It does not, Cindy! Another reason everyone is saying "Oh, wow! when they try it out. @Cindy Hi Cindy! Thank you for your interest in our brush. Ultra fine fibers O! Wow Brush has are densely and firmly packed so it won't easily leave lint and streaks. You need feel no concern about it.